John Sonntag/IceBridge/NASA Goddard Space Flight CenterA 300-foot-wide, 70-mile-long rift in Antarctica’s Larsen C Ice Shelf, as seen in November 2016. Antarctica is about to lose a very large iceberg that could calve “within days” or hours. New satellite data shows that when it breaks off, the iceberg will rival the volume of Lake Erie. Human activity isn’t likely responsible for this event, but carbon emissions are driving other worrisome changes to Antarctic ice. A large, meandering crack in an Antarctic ice shelf is about to create a colossal iceberg, and new satellite data gives a better sense of its mind-boggling size. A research group in the UK previously estimated the iceberg’s area as roughly that of the US state of Delaware. However, Europe’s ice-monitoring satellite CryoSat recently took the most precise measurements to date of the ice block’s thickness, allowing scientists to gauge its total volume. Researchers noticed the distinctive crack in the continent’s Larsen C ice shelf in 2010, but that rift has been growing rapidly since 2016. Now only a few miles of ice are keeping the chunk of ice connected to Larsen C.
When the crack splits open, the resulting iceberg entering the Southern Ocean will be about 620 feet (190 meters) thick and harbour some 277 cubic miles (1,155 cubic kilometers) of ice, said Noel Gourmelen, a glaciologist at the University of Edinburgh, in an European Space Agency press release. That’s big enough to fill more than 460 million Olympic-size swimming pools with ice, or nearly all of Lake Erie — one of the largest freshwater reservoirs in the world. The iceberg could break off of Antarctica “within days,” researchers previously said. When it does, scientists aren’t sure what will happen. 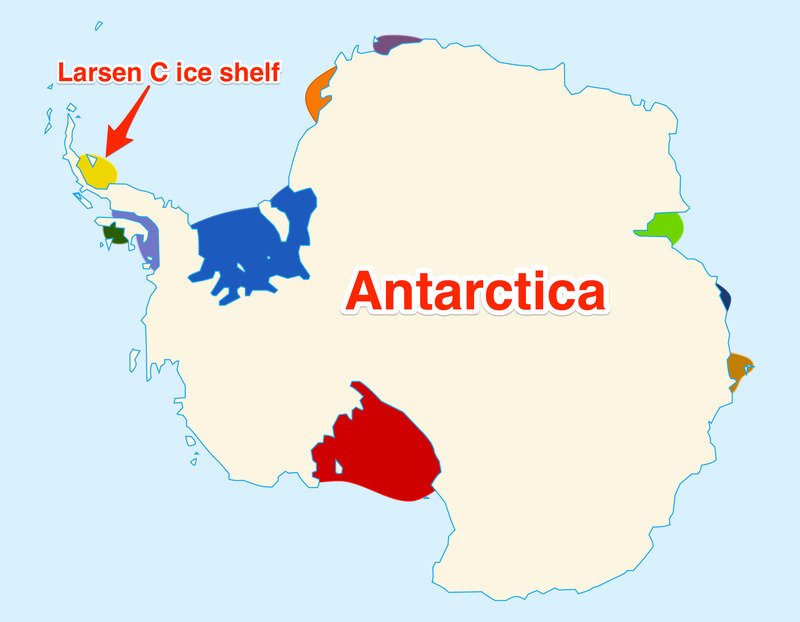 Antarctica’s Larsen C ice shelf is one of the largest such shelves in the southern continent. Adrian Luckman of Swansea University in the UK has been closely monitoring Larsen C with his colleagues at Project MIDAS, and released an animation of the rift’s rapid growth (below) that shows how it “jumps” as it slices through bands of weak ice. The ocean is shown in emerald green (top right), the Larsen C ice shelf is the light-blue patch, and the glacier behind it is depicted in white. It’s impossible to say precisely when the rift will snap the ice off, but recent satellite images have upped the stakes for the iceberg’s eventual calving. “New Sentinel-1 data today continues to show the rift opening more rapidly. We can’t claim iceberg calving yet, but it won’t be long now,” Martin O’Leary, a glaciologist with Project MIDAS, posted on the group’s Twitter account June 30. According to the latest measurements by the Sentinel-1 satellite, the crack needs to grow just 3 more miles to cut off the giant iceberg. Project MidasSatellite images modified by the MIDAS project to show how fast the Larsen C ice shelf is moving. When the iceberg does calve, its eventual melt will not significantly raise sea levels, since the ice already sitting in the ocean and displacing that water. But Luckman and O’Leary said that once Larsen C loses the the soon-to-calve iceberg, the rest of the shelf “will be less stable than it was prior to the rift”. 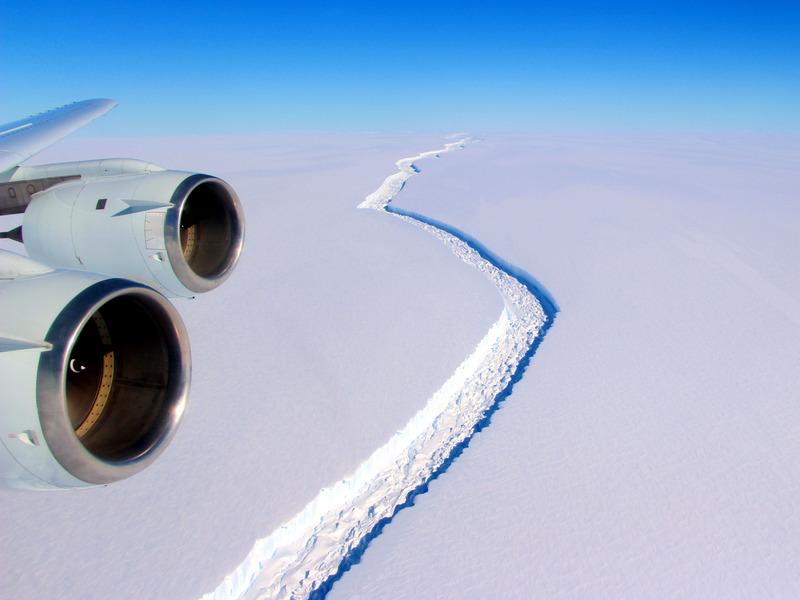 Put another way: There’s a very slim chance that this break could cause the entire Larsen C ice shelf, and an ancient glacier behind it, to slowly disintegrate and fall into the sea. If Larsen C and its accompanying glacial ice collapse, some scientists think sea levels may rise by up to four inches. However, Antarctic ice experts point out that such a loss is exceedingly unlikely, and would mostly be due to natural processes. Buy Fricker warned that we shouldn’t be complacent about climate change, which is mostly being driven by human activity.